Great landscaping often means biting the bullet and dealing with overgrown brush that quickly becomes unsightly and makes key parts of the lawn unusable. This process is generally intimidating because many homeowners simply don’t have the proper equipment to get the job done quickly. Most people resort to small brush cutters or other manual tools that, while effective, simply aren’t good for larger areas or more demanding brush that has grown in over a long period of time. When power equipment is the only way to get the job done and reclaim key areas of the lawn, the Little Wonder Brush Cutter might be just what homeowners need. Little Wonder’s brush cutter is manufactured in the same tradition as its edgers and hedge trimmers, with a powerful engine that pairs will with the equipment’s overall compact size. Highly durable materials make the brush cutter able to weed its way through virtually any kind of terrain or overgrowth, and homeowners will enjoy a first-rate commitment to maintenance, repairs, parts, and service via nationwide retailers. To get started with cutting brush more quickly and effectively, consider the merits of the company’s BRC-26 model. 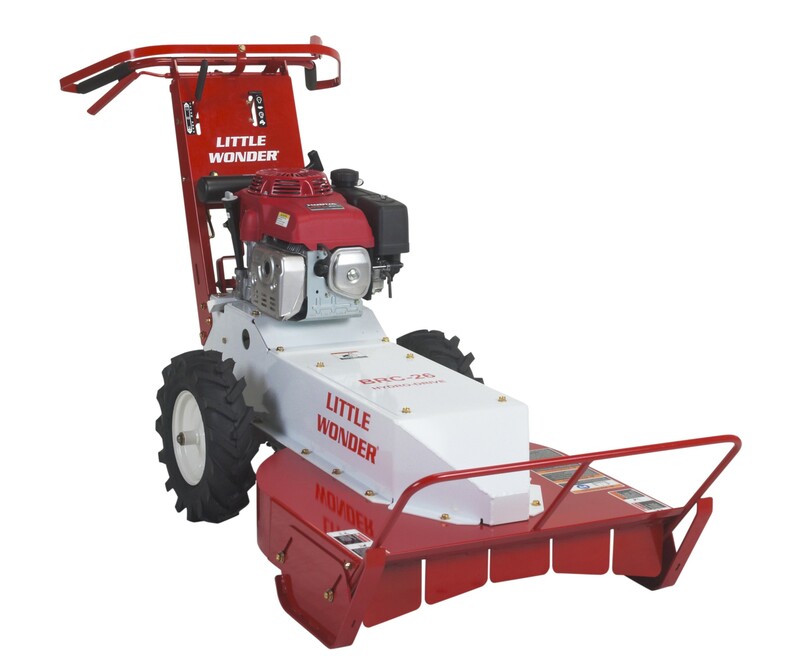 Little Wonder has long relied on two key vendors for most of its power equipment products, generally using either a Honda engine or a powerful Intek model produced by Briggs & Stratton. In the BRC-26 brush cutter, the company opts for a Honda engine to help homeowners clear their law of old brush and expand their amount of usable space. The BRC-26 comes with a Honda GXV390, so named because of its 390cc displacement. Honda’s powerful GXV390 is paired with a 2.2-quart fuel tank, which means homeowners won’t have to constantly refuel in the middle of an already strenuous brush clearing process. The engine is a four-stroke OHV model, paired with a Hydro-Gear T2 transaxle and an integrated hydrostatic pump. It all adds up to one of the most powerful and robust brush cutters currently on the market, perfect for everything from the front yard to areas around the pool or wooded patches. That’s actually pretty unconventional for most consumer brush cutters. Most models currently on the market aren’t even able to cut through saplings, with a limitation that is typically confined to thorny brushes and smaller weeds. Any homeowner unsure whether Little Wonder’s equipment will perform like they need it to should view this capability as a solid answer to that concern. In addition to its excellent cutting ability, which is certainly why anyone chooses a brush cutter, the equipment also comes with a pretty respectable forward speed rating. The BRC-26 can move forward at 4.2 miles per hour, while its reverse speed is rated by Little Wonder at 1.7 miles per hour. Those speeds might seem slow to the average buyer without much experience, but they’re actually quite fast when compared to competing models. In fact, it’s generally not advised that consumers go much faster than 4 miles per hour when cutting brush. If they do, injuries and other problems can sometimes result based on the brush, the terrain, and other factors. Of course, these faster speeds are all thanks to the mower’s hydrostatic transmission. The equipment allows for clutch-less gear shifting that simply isn’t available on very many competing brush cutters currently on the market. With that limitation removed, it’s easier to maneuver the equipment and quickly power it through even the most difficult tasks that face the average homeowner. The team at Shanks Lawn Equipment has been in the power equipment business for decades, and they have an extensive lineup of Little Wonder brush cutters and other equipment. Consumers who are looking to buy the best model for their unique needs will benefit from this experience, as well as from an extensive selection of OEM replacement parts for maintenance and repair needs. With the excellent power and fast forward speed of a Little Wonder brush cutter, most homeowners will simply have no more excuses when it comes to clearing the lawn and creating more usable space. For those of you who are in the Boonsboro, Clear Spring and Hagerstown, MD area, stop by our facility and let us know how your yard equipment is holding up. This entry was posted in Uncategorized and tagged Brush Cutter, Little Wonder, Shanks Lawn Equipment. Bookmark the permalink.